Bring the feel of an open-air market or a European beach to yourpatio or pool with this trendy nine-foot crank umbrella fromSafavieh. This Zimmerman model features a 100 percent polyestercanopy atop a rugged brown aluminum frame to ensure that it standsstrong and keeps you shielded in all kinds of weather. Tilt thecanopy for the perfect angle of protection, and easily raise andlower it with the smooth-gliding adjustment mechanism. 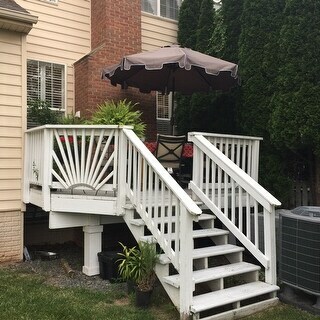 Enjoy a high-end, resort-like look when you make thisumbrella part of your outdoor decor. The thoughtful detailing andcontrast found in the geometric valance edging and high-qualitystitching provide you with an expensive look at an affordableprice. This umbrella has a very high style, resort like appeal. The color is a gray-brown and pairs nicely with a true gray. I was looking at other stylish umbrella makers like Santa Barbara umbrellas because there seem to be few fancy options out there. I couldnt swallow the $2500 per umbrella and decided to give this one a try first. I am SO glad I did. It is truly the look for so much less! The quality is good- it cranks open and closed with ease. It would say it is mid quality for mechanics which is more than I expected for the price!!!! The quality of the stiching and the fact that it has details and contrast fabric around the details set this umbrella apart from any other plain market umbrella! I HIGHLY recommend. I have two and I am thrilled with the purchase! 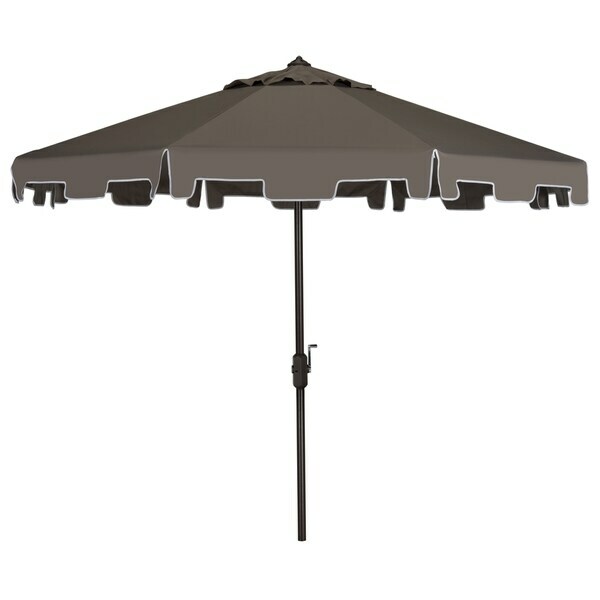 The Zimmerman Grey Tilt and Crank Patio Umbrella is a very attractive umbrella. It cranks to open and close easily. You have to use a little extra force to tilt, but overall a great find. The square scallop edge gives a modern look. Grey is a little more on the taupe side. Have enjoyed this umbrella for almost a year, now. It has had no problems. 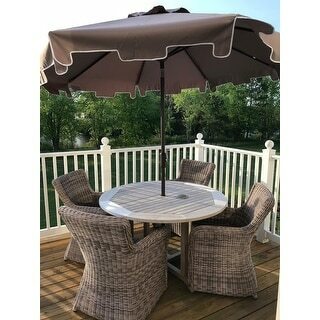 Beautiful, large umbrella and very well constructed for the price. Color is WARM grey - sort of a brownish grey - not taupe as there is no pink in it. If you're looking for a blue gray, this won't match but it is perfect for me. Crank operates smoothly as does the tilting mechanism. Love it. Nice quality, easy to crank open and closed, looks great. Note on grey color - has brown undertone (warm) versus blue (cool). Excellent umbrella except for one thing: Tilt button is too high for me (I'm about 5'4"). Really lovely,a little higher end look with edge detail.Fabric was lighter weight than I would have liked,but this did make them easier to handle and set up. All in all an amazing value. This is a great umbrella. Crank is easy to use. Would definitely recommend. Perfect umbrella. I'm buying more next spring due to it being such high quality! Very nice umbrella. Like the crank which is easy to use. Love the color. Excellent umbrella material quality and thick, sturdy pole for the price. Love the scalloped umbrella design. Pleased with purchase. Perfect size for our patio. We've had this umbrella for several seasons now and it's held up nicely. We have blue cushions and this gray matched nicely. I picked this because i loved the detail on the edges and is unique. It’s more of a tan/beige than grey but it’s so classy! GREAT LOOKING UMBRELLAS! WONDERFUL SHADING! "Anyone who has owned this umbrella for awhile, any fading? Should i go with lighter color?" "Can this umbrella stand with the support of a table? So just by itself in s stand?" "Is there a base included ? If so can you please display an image?" No, there is no base. Very nice looking umbrella and pole though. "How wide is this umbrella when opened"
It is a nine foot canopy. "Please: What is the diameter of the pole? Our opening is only so large - built in table to our barbecue. Thank you so much"
"Is this umbrella vented at the top? I can't tell from the photos if there's a vent or just a circle of closed fabric. Thanks." "It doesn't make sense that this umbrella is not as tall as an average adult, especially with all these good reviews. A person would have to bend to walk under it. Please, overstockcustomercare, take a moment to find out if the size listed, 64.8 inches, is correct. I would order this if it was taller. Thank you." We apologize for the confusion. The dimensions listed are the closed measurements. The height when open is approximately 99.2" inches. The umbrella is actually a little taller than your average patio umbrella...over 8 feet. We actually cut 4 inches off the bottom, since we prefer a lower umbrella. My husband is 6' 4" and he could walk under the umbrella without his head touching the flap that hangs on the sides. Nice, tall, sturdy umbrella!